The games are coming fast and furious now. 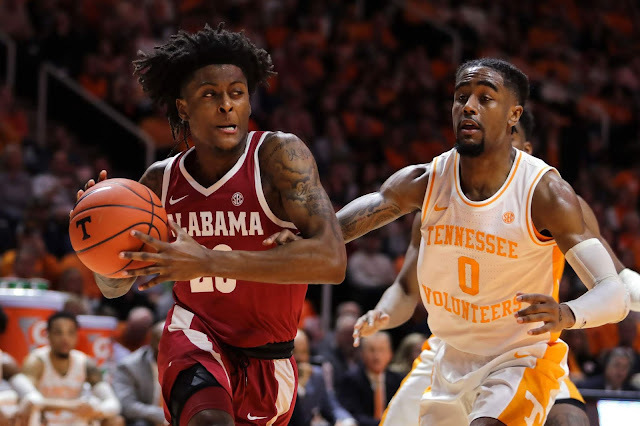 Alabama (11-6, 2-3) will have to rebound quickly from a tough road defeat in Knoxville because the Ole Miss Rebels (AP: 18; KenPom: 31; NET: 24) will be in Coleman Coliseum on Tuesday night. The Rebels (14-3, 4-1) have been one of the surprise teams in the league under first-year coach Kermit Davis Jr. after being picked to finish last in the preseason media poll. I didn't think Ole Miss would be this good, but with the experienced talent they returned, and my respect for Kermit Davis, I certainly didn't think they'd finish last. Game time is 8 P.M. CT. ESPNU will televise the game. The university is offering "buy one, get one free" tickets so they're begging people to come out and support the team for a mid-week game. If you live in Tuscaloosa and can easily make it out to Coleman, please do. This team still has a lot to play for, and they're going to need all the support they can get. My Two Cents: Alabama was oh so close to what would have been a monster win on Saturday. It's rare in recent years that we've seen an Alabama team put a top five team on its heels the way Alabama did in that second half on Saturday. While it's disappointing that they lost, the team has to come away from that game with some level of confidence in knowing that if they don't shoot themselves in the foot late in the second half, they're not only winning that game, but doing so by multiple possessions. Ole Miss enters this game as one of the elite offensive teams in the country. The Rebels are ranked 23rd in offensive efficiency, 11th in effective field goal pct (56.2%), 56th in 3-pt pct (37,1%), 16th in 2-pt pct (56.5%), 32nd in free throw pct (75.5%) and, you guessed it, are an effective rebounding team with a 33.5% offensive rebound rate (ranked 40th). It's been a struggle at times for this Bama team on defense. If it's a struggle on Tuesday night, our guys are going to have a tough time hanging with this Rebel team. The biggest change in Ole Miss this season from recent years has been on defense. I wouldn't call them an elite defensive team, but their defensive rating is the best it's been since the 2012-13 season. They're ranked 62nd in defensive efficiency, 61st in effective field goal pct, 84th in opponent turnover pct (20.7%), 89th in block pct (11.1%) and 41st in steal pct (11%). They hold their opponents to a 45.1% 2-pt pct, which is concerning when you think about how much Alabama relies on Donta Hall to score in the paint. This is a really good, well-balanced team that should continue to be a factor in the SEC race as the season progresses. There are no glaring weaknesses for this Ole Miss team. They don't dominate teams on the glass, but their opponents have a lower offensive rebounding pct (27.8%) than the national average (28.6). Alabama of course has been great on the offensive glass (33.4%), and that will have to continue if Alabama is going to win this game. Ole Miss doesn't miss a ton of shots so Alabama has to limit second chance opportunities when the Rebels do miss. Ole Miss does send their opponents to the foul line more than the national average, but Alabama's struggles at the line could negate that advantage if it arises. Needless to say, the free throw pct they shot on Saturday isn't going to cut it most days, and certainly not against top 25 teams. 3-pt defense could be better for Ole Miss. Their opponents average 34.5% from the 3-point line, which is just over the national average of 34.2%. Taken all together, Alabama must hold their own on the glass, shoot well from 3-pt range, get to the foul line, make shots when they get there, and I believe they've got to do something they've struggled with all season and force Ole Miss into some turnovers. This group of Rebel perimeter players are going to be tough to defend if they're comfortable and get into a rhythm. Players to Watch: In my opinion, John Petty had the best game of his Alabama career on Saturday. It was a fantastic performance that was spoiled somewhat by the ending of the game, but it was a reminder of just how good this dude can be when everything is clicking. I'm of the belief that John has improved on both ends of the floor this season and has had a good season as a result. It could also be fairly argued that he's yet to reach his ceiling as well. If John can play even close to what he did on Saturday on a consistent basis, he can be one of the very best players in the SEC. And I've thought that since he announced he was coming to Alabama. It would be great if Saturday marked the beginning of a new phase in JP's career. I also want to mention Tevin Mack. He only played seven minutes on Saturday, and I think that was due to how the game evolved more than anything else. However, it simply hasn't been the type of season I envisioned for him. He's been solid, but I thought the possibility was there for him to be very good. With the way Ole Miss can light up the scoreboard, I got a feeling that Alabama is going to need all hands on deck offensively. Tevin and John have yet to have a game where both of them get going on the offensive end. It sure would be nice if that happens on Tuesday night. After facing a dynamic duo on Saturday at Knoxville, Alabama will be faced with another quality duo on Tuesday in the form of Terence Davis and Breein Tyree. The duo is averaging a combined 33.7 ppg, 9.5 rpg, 6.8 apg, and 2.5 spg. Both players make just under 50% from the field, are great 3-pt (a combined 40.2%) and free throw shooters (78.5%). They are both as likely to take their defender off the dribble as they are to shoot over them. Good luck to the Alabama players trying to find a way to limit these two guys. Prediction: I have mentioned, since at least the Missouri preview, about this stretch of games that Alabama is now in the midst of. In my opinion, it's the toughest stretch of games on the schedule. The next four games feature three ranked opponents and a road game at Baylor. Most teams in the country would potentially struggle against a schedule like that. For an Alabama team that has struggled to establish consistency, particularly on the defensive end, and close out games, this schedule could be too much for this team to handle over the next two weeks. On the other hand, Alabama has had its share of success in games vs ranked opponents during the Avery Johnson era. Alabama teams are 12-11 so far vs ranked teams under Avery. While Ole Miss has played well, I would put this Bama roster up against any team in the league on a good day. The problem for me in posting a prediction is will Tuesday be a good day for this Alabama roster? Will the students and fans feel compelled to turn out for an 8 P.M. game on a Tuesday night? I simply don't know. I'll be optimistic (shocker, I know), and predict that Alabama carries over some confidence from Saturday and improves to 13-11 vs ranked teams during Avery's tenure.